Thomas Irvine McElroy built this beautiful Greek Revival Plantation Home on 949 acres and presented it as a Wedding Gift to his young bride, Sarah Jane Maxwell. Lavished with numerous architectural features, it is accented with Italianate detail, spans over 7,000 sq. ft., with 14′ ceilings, 12′ doorways, 9′ windows, 13 original rooms – most are 20′ x 20′ with some even larger, and a grand cherry floating spiral staircase. 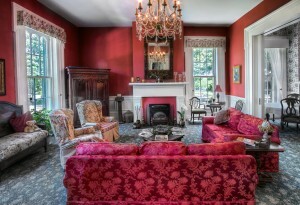 Its colorful past includes stories of an Antebellum Plantation, use as a Civil War Confederate Encampment and Union Field Hospital after the Battle of Perryville, Birthplace and Childhood Home to Phil Simms – former NY Giants Quarterback and Super Bowl XXI’s MVP, a popular Dinner Hall, and a Foster Children’s Home to over 300 children. Today it is an award-winning Bed & Breakfast, Wedding and Special Events Showplace, Alpaca & Llama Farm, and Fiber Farm Store.